Along with many wonderful, golden beaches and excellent hotels, Miami is home to a diverse range of ethnic communities and stylish architecture. Miami has a number of main districts and areas, although many of the boundaries of these districts are not clearly defined. Downtown Miami is a vibrant and diverse area of the city, filled with clothes and jewelry shops, restaurants, cafés and fast-food stands. The downtown skyline is one of the most stunning in the whole of America and at night, spotlights illuminate the tall skyscrapers with bright colors, which are reflected in Biscayne Bay. One of the main attractions in downtown is Flagler Street, which is a loud and busy strip, full of shops, entertainment and atmosphere. Downtown Miami is also full of countess beautiful buildings and architectural jewels, many of which date back to the early 1900s. The general dimensions are between North-East 15th Street and South-East 24th Street, running from the Biscayne Bay waterfront to Route I-95. Within this 28-block-wide area, the district is particularly rewarding for those exploring the area by foot and there are a large number of tourist attractions. The Art Deco district is at the very center of the city's reinvention. Concentrated between the 5th and 23rd streets, this neighborhood dates from the 1930s and 1940s. This beautiful part of Miami almost didn't survive as developers wanted to knock the historic buildings down and install large high-rise blocks of apartments. 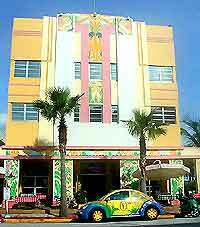 However, an enthusiastic local volunteer group managed to educate the developers and locals and persuade them of the historical significance of these Art Deco buildings, and they will now be preserved in Miami forever. There are more than 800 Art Deco buildings in this area, including many excellent hotels close to the beachfront. To learn more about the history and buildings, walking tours are available at the Welcome Center, where you will be shown some of the numerous highlights. South Beach is one of the city's most exciting and lively areas, occupying the southernmost 3 miles / 5 km. The South Beach area is full of up-and-coming art galleries, stylish diners, stylish Art Deco buildings and glorious beaches, attracting large numbers of tourists. This area of Miami is also popular with photographers and film crews, who use the stunning backdrop and beaches to their best advantage. South Beach is a particularly social area of Miami and during the day time the beaches are lined with sunbathers, and at nighttime, the ten blocks of Ocean Drive become the center of the city's famous nightlife, with numerous chic terrace cafés and many top nightspots. Central Miami is a quieter area than South Beach and this is one of the most wealthy areas of the city, full of palatial homes of some the richest residents. There are also a number of excellent golf courses here, together with luxurious hotels and country clubs. The southern edge is defined by the Collins Canal, which was constructed in the early 20th century. Central Miami was particularly popular in the fifties and many glamorous buildings remain from this area. Home to the largest ethnic group in Miami, Little Havana has a large community of Cubans, which has been growing rapidly over the last few decades. Little Havana contains a number of interesting, exotic restaurants, parks, monuments, memorials, shops and food stands, all of which are strongly influenced by the thriving Cuban culture. The Coral Gables district is located south of Little Havana and is one of the most individual and distinctive areas of Miami. With around 12 square miles of wide boulevards, attractive streets and many stunning buildings with Spanish and Italian architecture, Coral Gables is a very stylish area of the city. Coral Gables has four grand entrances on the main access roads and the most impressive can be found to the north, along a stretch of South-West Eighth Street. In particular, the million-dollar Douglas Entrance, situated on the junction with Douglas Road, features a large gateway, tower and a number of shops, offices and studios. The quieter areas of Coral Gables are known as the 'Villages' and these include the Chinese Village, the French Normandy Village and the Dutch South Village. Coconut Grove is one of the most fashionable areas to be seen in Miami and is often full of celebrities and the glitterati. This district also has numerous art galleries, trendy restaurants and cafés, huge bay-view apartments with spectacular views. Coconut Grove is situated along the shores of Biscayne Bay and is full of characters from the last century. The main areas of Coconut Grove include Villa Vizcaya, Central Coconut Grove, Charles Avenue, Black Coconut Grove and South Coconut Grove. Coral Way is the commercial area north of Coconut Grove and embraces the neighborhoods of Brickwell, Coral Gate, Douglas, Parkdale-Lydedale, Shenandoah, Silver Bluff and the Roads. At the weekends, Coral Way is particularly popular and the district contains some of America's most critically acclaimed condominium designs and historic houses. The South Miami district is situated to the south of Coral Gables and Coconut Grove and is full of middle-class suburbs and family homes, reaching the edge of the Everglades. 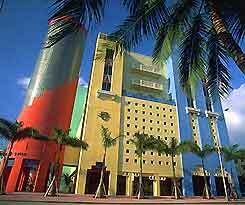 There are several excellent golf courses in South Miami, small shopping malls and a number of tourist attractions, including Parrot Jungle, Metrozoo and the Gold Coast Railroad Museum. 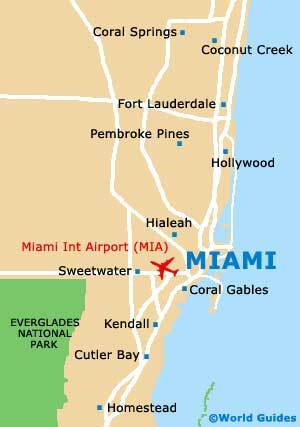 The Key Biscayne area of Miami is a compact and well-presented community, located five miles from the coastline. Key Biscayne is an expensive place to live and contains many upmarket houses and condos - Richard Nixon once had his presidential winter house is this area. There are several good beaches in Key Biscayne and a state park, with an excellent cycle path running the entire length of the park. Unless you have a private yacht, the only way to reach the city's Key Biscayne area is via the Rickenbacker Causeway, which is a four mile stretch of South-West 25th Road, to the south of Downtown Miami.